The Tumble Form Starfish Bath Chair is an adaptive bath chair designed to reach new levels of functionality, adjustability and convenience. KJW: bc14101. Category: Bath, Toilet, Incontinence. 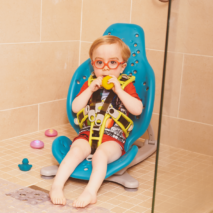 The Tumble Forms Starfish Bath Chair is designed to reach new levels of functionality and ease of adjustability. The adaptive equipment has angle adjustable chair legs with articulating back and leg support that offer a range of height and angle positions to make bath or shower time more easy and fun. Only one hand is needed to release the leg and seat locks located on both sides of the chair making adjustments a breeze. 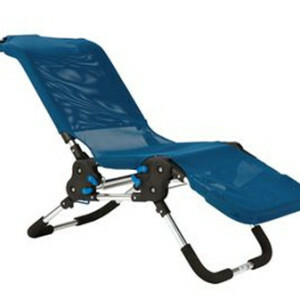 The padded support bars give added positioning comfort. The frame is aluminum, so it’s easy to lift and carry. It folds flat for convenient storage or transport and includes nonslip foam pads for secure tub placement and protection. 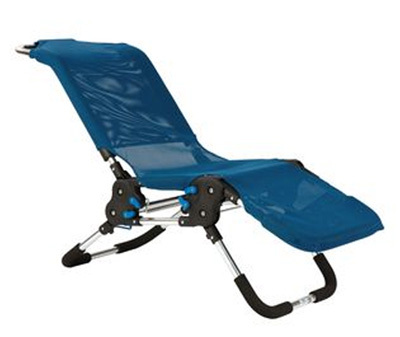 The seat features extra-soft, breathable mesh material that is removable for machine washing and comes in the fun color of blue. Seat height adjusts 2” – 17”. Supports up to 159 lbs. Back Reclines to 0°, 30°, 60° and 90°. Leg support adjusts to -30°, 0°, 30° and 60°.